Dreaming of a desert-island getaway? Then come to the Cook Islands, an archipelago of 15 islands set in the South Pacific between Hawaii and New Zealand. Stay on the main hub, Rarotonga, or venture to a more remote destination to discover soft-sand beaches, traditional Polynesian culture and perfect blue seas. Dive and snorkel to explore vibrant coral reefs and hike through jungles to lush lagoons and mountain viewpoints. Find out all you need to know about planning a trip to the Cook Islands, from flights to visas and how to get around, in this guide. You can visit the Cook Islands all year-round and experience fine tropical weather. However, you may want to avoid the months between December and April when there are frequent afternoon storms due to the cyclone season. The upside is that prices fall during this period and the islands are less crowded. The ideal time to visit the Cook Islands is in the shoulder months of April, May, September and October. During this time, temperature and humidity levels are at their most pleasant, although it’s busier and more expensive, so book your hotels well in advance. 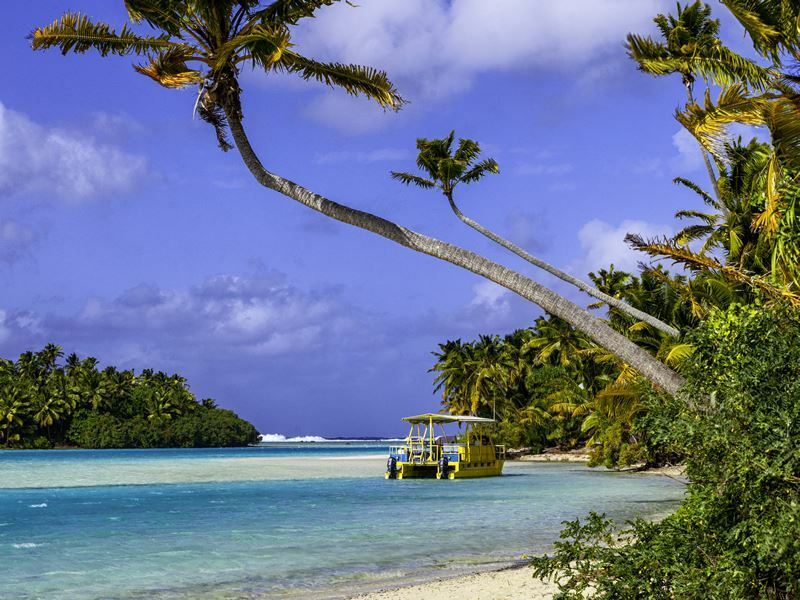 The Cook Islands has a year-round tropical climate that boats plenty of sunshine and blue skies. The weather is warmest from November to April, when it averages between 25 and 30 degrees Celsius, but there may be short afternoon storms during cyclone season between December and April. You can enjoy slighty cooler and drier weather from May to October when temperatures average between 22 and 28 degrees Celsius. 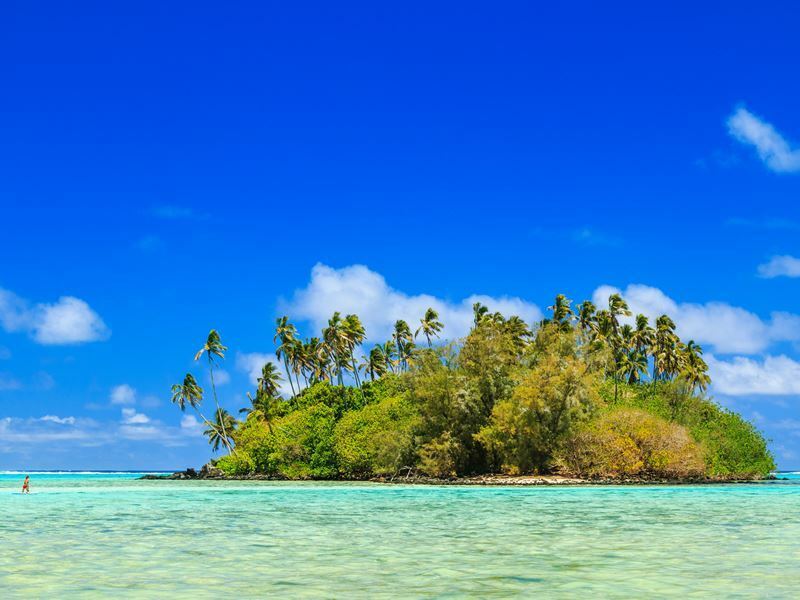 There are no direct flights from the UK to the Cook Islands but you can take connecting flights that change in either Los Angeles, USA, or Auckland, New Zealand. This offers the possibility of combining your trip to the Cook Islands with a road trip in New Zealand or the USA. 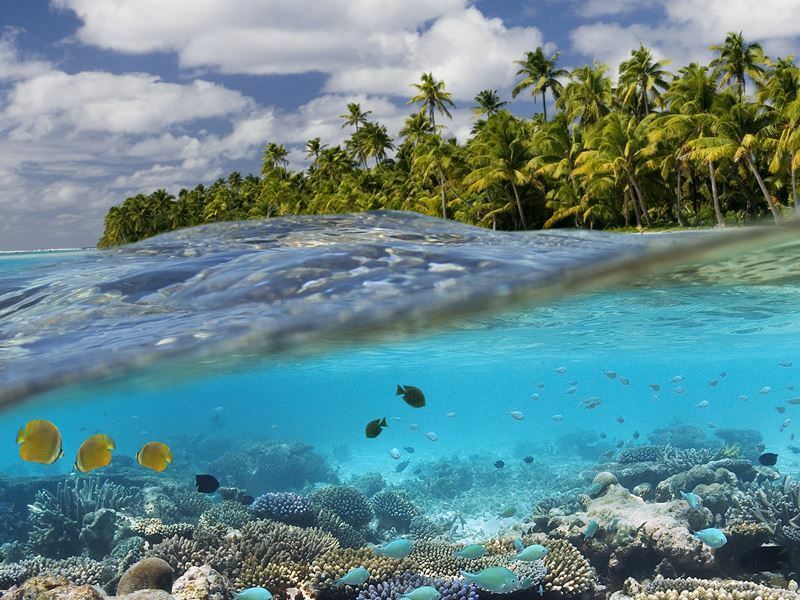 Fiji, American Samoa, Tonga and French Polynesia are all just a short hop from the Cook Islands and can be added to your trip to explore more of the region. It takes between 25 and 35 hours to fly to the Cook Islands’ main hub, Rarotonga, with Air New Zealand. The shortest option has a four-hour layover in Los Angeles. Longer flights change in Doha, San Francisco and Auckland and combine with other airlines such as Virgin Atlantic, United, Qatar Airways and British Airways. Transfers will depend on where you’re staying, but many hotels offer free airport pick-ups. If you’re holidaying on Rarotonga, you can easily take a taxi or private car to your resort, or an internal flight to one of the other Cook Islands. The Cook Islands has strict regulations about entering the country with food products to preserve its unique bio-diversity. Any plants, food or perishable items will likely be confiscated upon arrival. 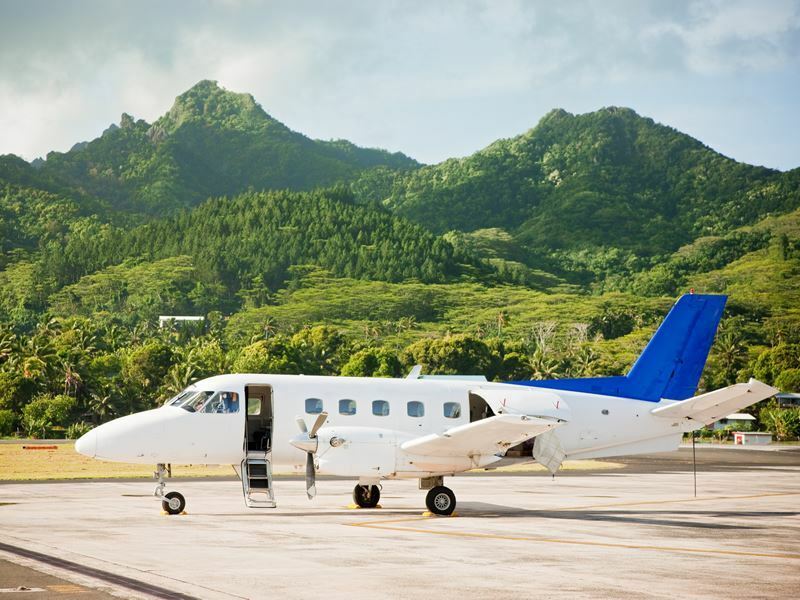 • Internal flights – Air Rarotonga offer domestic flights to many of the Cook Islands, with daily departures to Aitutaki and less frequent routes to Atiu, Mangaia, Mauke, Mitiaro, Manihiki, Penryhn and Pukapuka. Flights can take less than two hours and typically cost between £100 and £200 one way, depending on when you travel. Book online in advance to get the best deals. • Bus – the only bus service in the Cook Islands is on Rarotonga, which has one main road that loops around the island and a regular bus service. Taxis and car rental services are available on the main islands, Rarotonga and Aitutaki, but can be expensive. • Boat – there’s just one shipping company in the Cook Islands which isn’t ideal for passengers since it has basic facilities and runs just a couple of times a month. Private cruises and luxury yacht charters are a great option for island hopping your way around the country, prices vary depending on the type of vessel, itinerary and season. • Cycling – the Cook Islands are small enough to cycle around, which is one of the most scenic and fun ways to explore. Bike rental services are common all over the islands, your hotel may even provide complementary bikes for you to use. The Cook Islands uses New Zealand Dollars, but you may receive Cook Island coins as change. There are ATM’s and banks on the two main islands, Rarotonga and Aitutaki, but they may have hefty withdrawal fees, so it’s a good idea to exchange money before you leave the UK. If you do take money out in the Cook Islands, be aware that your UK bank may also charge a foreign transaction fee. Contact your bank to ask about this and let them know your travel plans so they don’t block your card for suspicious overseas activity. The Cook Islands uses 240 volts with a frequency of 50Hz. Be sure to take an Australian-style, three-pinned flat plug adapter with you. There is a small risk of contracting Dengue Fever or the Zika Virus through mosquito bites in the Cook Islands. You cannot be vaccinated for these diseases, so it’s important to practise good bite prevention. Use repellent with DEET and cover up in the evenings, especially when you’re by the water. If you fall ill, consult a medical professional for advice. The Cook Islands is 10 hours behind GMT. The biggest event in the Cook Islands is the Te Maeva Nui Festival at the end of July, which celebrates the country’s independence with a week of festivities. There are parades, floats, local food, music and dance performances. Another highlight is Te Mire Ura, the dancer of the year contest. This takes place in April in Rarotonga and features the country’s top dancers performing cultural pieces in traditional costumes. The Tiare Flower Festival in Rarotonga in November is another favourite, featuring floats with elaborate flower decorations and a pageant. The biggest sporting event in the Cook Islands is Vaka Eiva, a world-renowned canoeing festival. 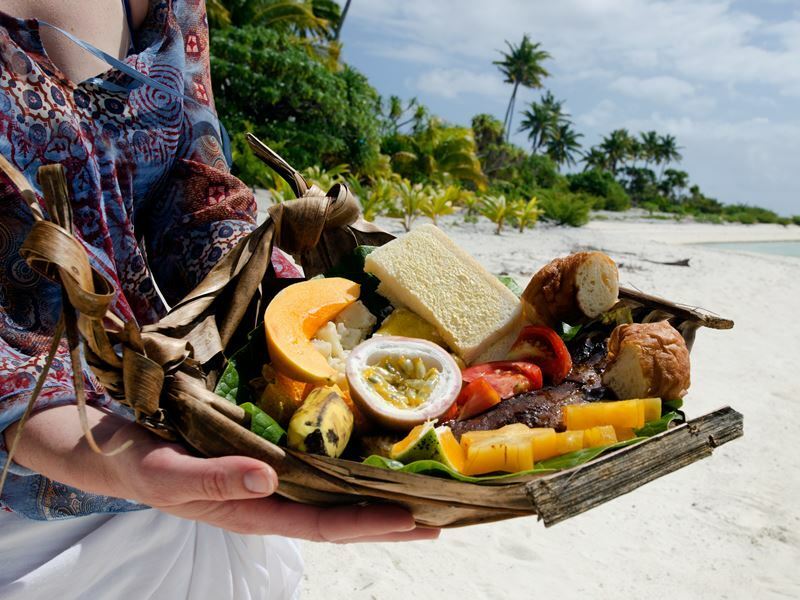 Seafood, tropical fruit and potato-like taro all feature heavily in Cook Island cuisine. Ika Mata, which is raw fish with coconut milk and Eke Takare, octopus in coconut curry, are popular dishes. Meat, fish and vegetables are often cooked in a traditional Umu underground earth oven and delicious local fruits include papaya, banana and breadfruit. Try Poke, a cooked fruit pudding with coconut milk for dessert. Nightlife in the Cook Islands is fairly low-key and most visible in tourist resorts and in Rarotonga, where bars and clubs stay open until 2am. Enjoy relaxed beach bars for sunset cocktails and some live music and evening entertainment at the top resorts. Friday nights are busiest and some companies even offer bar tours. The national drink on the Cook Islands is Tumunu, which is made from fermented oranges but there are also several microbreweries producing tasty beers. Imported wines and spirits are available at hotels but are typically expensive.